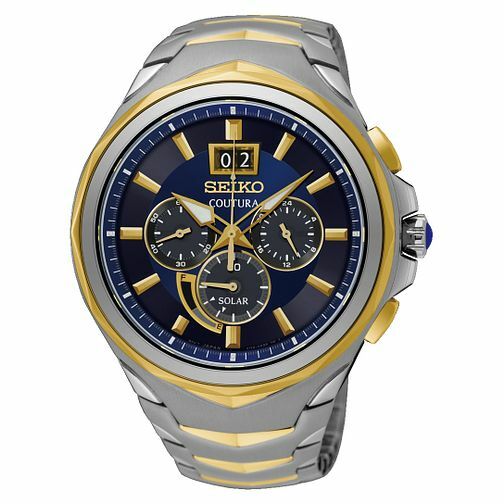 This Seiko Coutura two tone stainless steel bracelet men's watch is the perfect everyday timepiece for the modern man. As the inventor of the quartz watch in 1969, Seiko has led the watch industry for four decades in refining quartz technology for each new generation. Today, Seiko also offers a full range of quartz watches powered by light, capable of converting all types of light into energy, with no battery replacement ever required. Seiko Solar is a bright idea that is good for the planet. Seiko Coutura Men's Two Tone Steel Chronograph Watch is rated 5.0 out of 5 by 3. Rated 5 out of 5 by Anonymous from This product was a gift for my husband and he is very pleased with it . I chose this watch as a gift for my husband as it looked so classy with its blue dials and as we have always had Seiko watches as they are so reliable and the quality first class . Rated 5 out of 5 by Anonymous from Excellent watch. Lovely looking watch, looks brilliant for every occasion. And it gets comments from a lot of people about how good it looks.